This section provides a list of 14 different types of UML diagrams. They are divided into 3 categories: Structure Diagrams, Behavior Diagrams, and Interaction Diagrams. What Is a UML Diagram? A UML diagram is a visual description of structures and/or behaviors of a system using UML notations and rules. 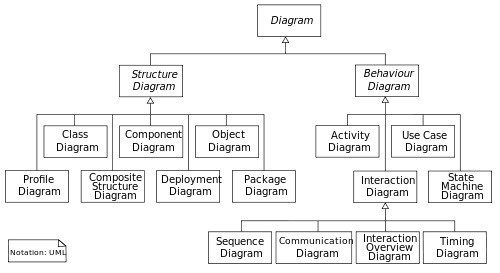 Structure Diagrams - Includes the Class Diagram, Object Diagram, Component Diagram, Composite Structure Diagram, Package Diagram, Deployment Diagram, and Profile Diagram. Behavior Diagrams - For general behaviors. Includes the Use Case Diagram, Activity Diagram, and State Machine Diagram. Interaction Diagrams - For interaction related behaviors. Includes the Sequence Diagram, Communication Diagram, Timing Diagram, and Interaction Overview Diagram. The picture below shows you how these 14 types of UML diagrams are related to each others.